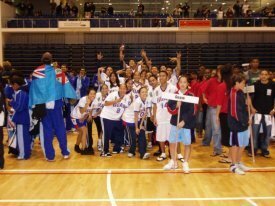 On July 30, 31, and August 1, 2007, Team Guam will be conducting try-outs for boys and girls 19 and under. The event will take place at the University of Guam Field House at 7:00pm daily. Please bring ID, running shoes, basketball shoes, and water bottle for each try-out date. For more information please contact Tony Thompson at fdadmin@eccomm.com.